Happy post 4th of July, my fellow geeky Americans! To all of you who come from across the world, perhaps you will mirror our American festivities by celebrating your own freedom in some spectacularly geeky fashion. I say to the citizens of the world this: Hold up your comic books! Wave your graphic novels in the air while dressed in cosplay attire. Press down the “A” button repeatedly as you game! Do you know what else you can do to enjoy that freedom? Why, of course you do. You can settle in to learn a little bit more about the wonderful Katherine Gilrane. I have had the pleasure of getting to know Katherine this last half of a year. She does many things including: magically fixing finances, finding homes, crafting digital art, and the reason we are here today which is writing! 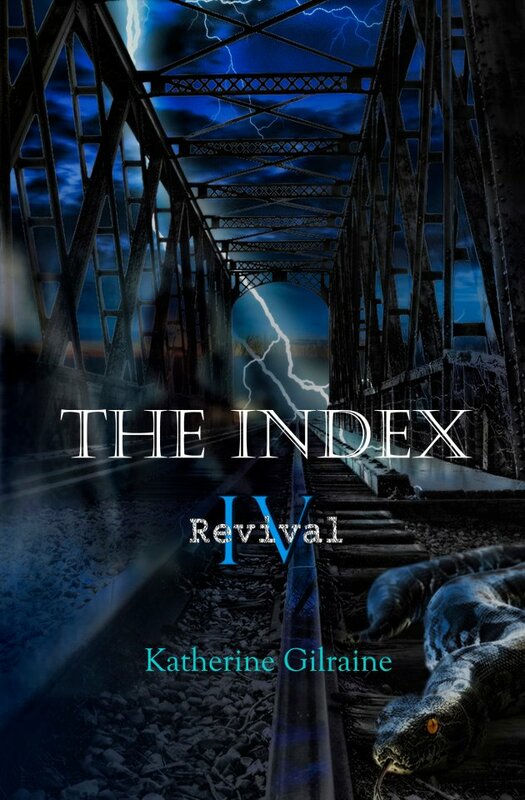 A series sure to set off fireworks the more gain it gets, The Index combines science fiction and fantasy in an intergalactic free for all that pits cosmic forces of good and evil. I bet that’s way more intense than your Mother’s 4th of July jello leftovers. 1.) Welcome to The Geeky Chic! – Good morning! 2.) Tell us a little and the world of The Index Series. – The Index Series follows a group of intergalactic cops as they do their jobs – all over the known universe as they get to sort out the universe’s curveballs. They get to save Earth, confront a megalomaniac, try and unravel a personal mystery, and at the same time, they learn something about themselves too. In other words, it’s a story about people, their strength, and their spirit. And they have a lot of spirit. 3.) How did you come across the idea for The Index?- The ideas have been in the making since I was a kid. I grew up reading old-school adventure stories; Capt. Thomas Mayne Reid, Mark Twain, etc. I wanted to create an adventure story too, just…a little out-there. Well, it kind of turned out to be way out there! 4.) I found it felt like fusion piece of sci fi and fantasy. Is it a fusion piece? – It is indeed. 5.) What do think the main appeal is with science fiction and fantasy? – It’s an incredibly liberating genre. The only rule in sci-fi/fantasy fusion is make it work and keep it consistent, but other than that, anything goes and everything is par for the course. There is no limit to what I can cook up as part of The Index world, and there’s no limit to the outtakes my characters can have. 6.) Favorite character in your series and why. – At this moment – Kataria. She’s not exactly a heroine, nor is she a flawed-hero sort, but she has a lot of growing to do. Especially in the coming arc of the series. She has to take charge in a very personal situation, and having never thought that she would find herself in this position, she’s struggling to get comfortable with several changes in her life. But she has one thing going for her: she has a lot of determination. And that is a very admirable trait. 7.) Was there anything you had to research for your story you are now expert on? – Oh yes. In part because I have a crim-justice degree, I wanted to give the series a CSI-style twist, but I had to really, really dig into anatomy and pathology. It’s a topic I’ve only loosely covered as part of my college education. You know what that meant for the story: research. I went back to my biology notes, then hit up every single pathology/anatomy text I could conceivably acquire online. I’m no expert, and I am by no means a medical examiner, but I have a whole new depth of knowledge about ways to die on a medical level. 8.) What authors inspire you to write? – Stephen King. Philippa Gregory. Pretty much anyone with a good and solid voice. 9.) As we venture in to Book 1, is there anything for the curious reader to keep in mind? – I will warn any Book 1 reader now: you will have questions, and some of them may be discouraging. Know this: the other books will have answers. What seems disjointed now will not seem so. Ask your questions, but don’t let them be a discouragement. 10.) Any upcoming Index projects we should be aware of? – I just finished remastering Book 1 as a screenplay. Maybe and hopefully, I will have some luck in turning it to the screen! For More Gilraine Good Times..
A fabulous interview by Olivia, aka The Geeky Chic!